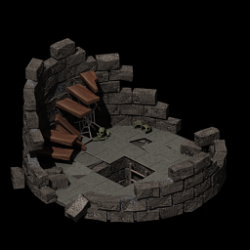 Here's a Broken Tower for a 2D isometric game. It's designed for a base tile size of 64x32 (e.g. the ladder hole in the middle is that size). Also attached is the Blender file and the GIMP layered file. The method I used to create layers: I rendered the entire tower first. Then used those blank planes to render just the foreground and just the above-ground. In GIMP I start with the foreground layer, use "Alpha to Selection", shrink the selection 1 pixel and sharpen the selection, and delete that selection from the lower layers. 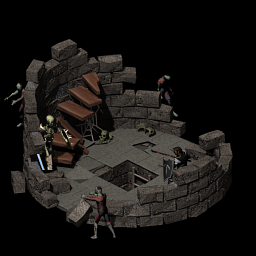 In a tile-based engine you'll want to slice up the layers in fixed width sections as needed.